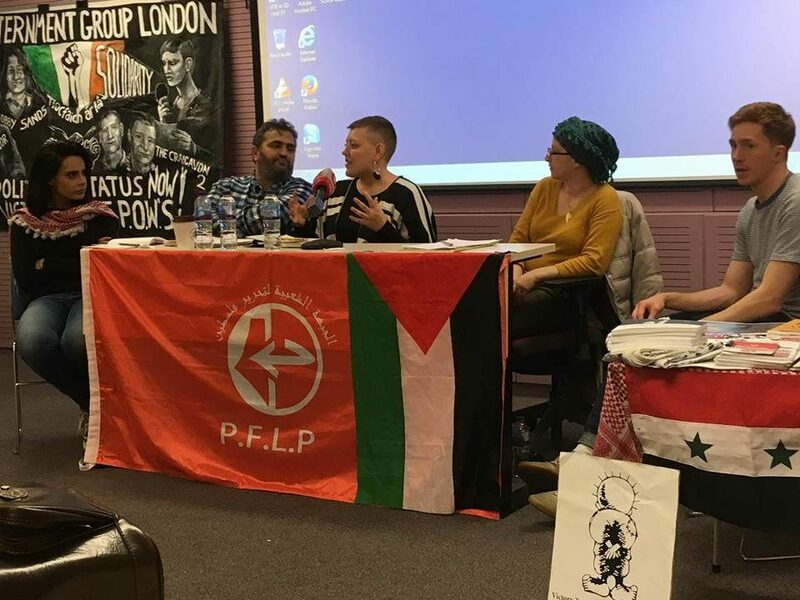 Samidoun Palestinian Prisoner Solidarity Network participated in events organized in London and Manchester on 16 and 17 April by activists with the Revolutionary Communist Group, Fight Racism! Fight Imperialism!, Victory to the Intifada and others. The events focused on Palestinian Prisoners’ Day and the struggle in Palestine today, throughout 100 years of resistance to colonization and especially in light of the recent #GreatReturnMarch taking place in Gaza to affirm Palestinian refugees’ right to return home and break the siege. The events featured talks by Khaled Barakat, Palestinian writer and coordinator of the Campaign to Free Ahmad Sa’adat and Charlotte Kates, international coordinator of Samidoun Palestinian Prisoner Solidarity Network. 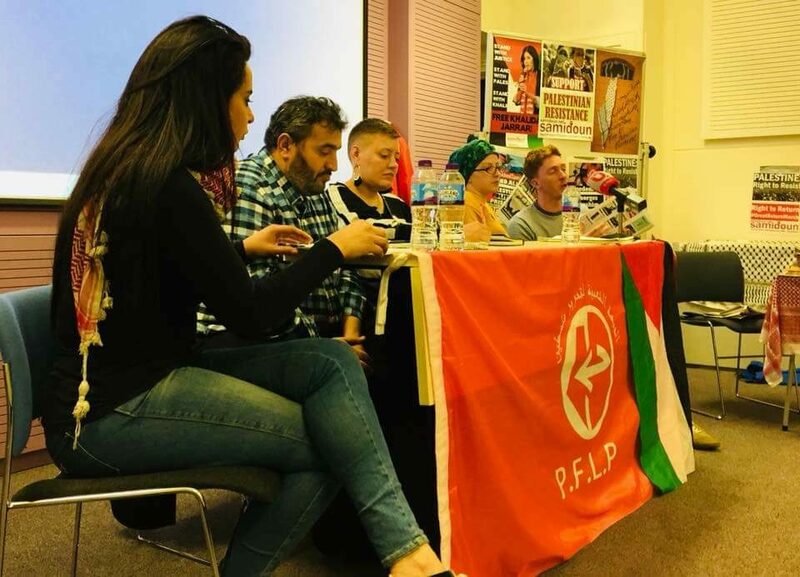 In London, they were joined by Maysa Shqeir, Palestinian scholar, and Ben Geraghty of the RCG. 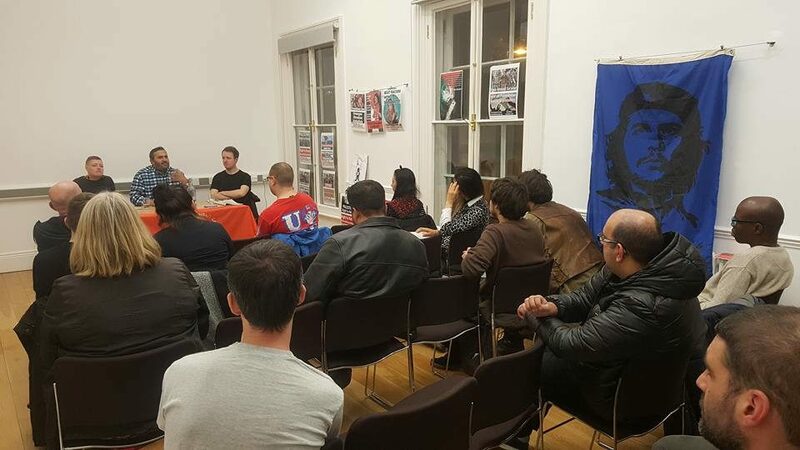 At both events, Kates discussed the situation of Palestinian political prisoners in Israeli jails and the importance of international solidarity in the struggle for their freedom. She discussed the historical role of British colonialism in jailing Palestinians, including the introduction of administrative detention – imprisonment without charge or trial – in occupied Palestine. In addition, she noted the role of British guards, some of whom also served as guards in colonial prisons in the north of Ireland, in participating with the U.S., Israel and the Palestinian Authority in the imprisonment of Ahmad Sa’adat in Palestinian Authority prison in Jericho before his kidnapping in 2006 by Israeli occupation forces. She provided statistics and information reflecting the current number of Palestinians jailed behind Israeli bars and discussed their role in struggle, including the current boycott being conducted by administrative detainees of Israeli military courts in order to expose the sham “legal system” imposed by Israeli colonialism. 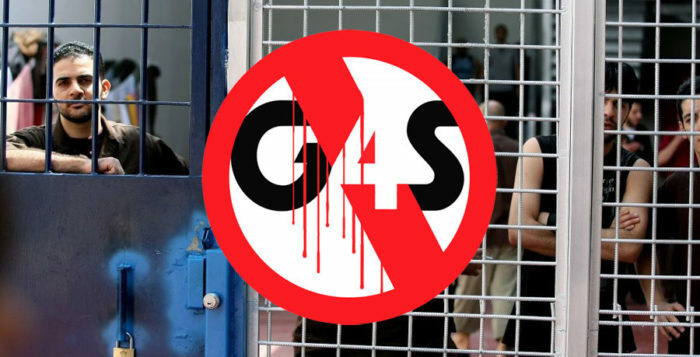 She also noted that Palestinian prisoners are not only held behind Israeli bars but that strugglers for Palestine are persecuted internationally, particularly highlighting the case of Georges Ibrahim Abdallah, who has been imprisoned for 33 years in French prison. She also noted the case of the Holy Land Five, five Palestinian Americans sentenced to up to 65 years in prison for their charity work in the community, as well as the role of “anti-terror” laws in seeking to criminalize and suppress Palestinian community organizing and Palestine solidarity. She spoke about the pernicious role of programs like Prevent in marginalizing and attempting to silence the voices of oppressed communities seeking justice, especially justice in Palestine. During her presentation, she spoke about several specific cases, including that of student prisoner Omar Kiswani, the chair of the student council at Bir Zeit University, and over 300 Palestinian university students behind bars. In addition, she discussed the case of Ahed Tamimi and her fellow 350 Palestinian child prisoners behind Israeli bars and the case of Abdul-Razeq Farraj, a Palestinian agricultural workers’ organizer and land defense movement leader who has been held for years in administrative detention without charge or trial. Palestinian writer Khaled Barakat provided an expansive look at the Palestinian struggle confronting Zionism, imperialism and reaction over 100 years, particularly noting the continuity of Palestinian resistance against British colonialism and its Balfour declaration to today’s Palestinian resistance movement. He focused on a class analysis of the Palestinian struggle today, highlighting the leading role of the popular classes of Palestine in leading the revolution historically and at present, saluting the Great Return Marches in Gaza. “The popular classes in Gaza today are teaching all of us a lesson,” emphasized Barakat. He noted that colonizers frequently seek a local entity to serve as a buffer zone between the people and the occupying power and how this role can be filled by a social class or sector and their administrative institutions. Looking back at the 1936-1939 revolution in Palestine and noting the analysis provided by Ghassan Kanafani, he analyzed the leading role of workers and peasants in the revolution and the confiscation of their power by feudalists who set themselves up as spokespeople and representatives to British colonial authorities. He then examined the popular Intifada of 1987-1993 and the confiscation of the struggle of the masses by a leadership that participated in the Madrid and Oslo process, culminating in the establishment of the Palestinian Authority. He discussed the importance of Palestinian national unity and how it can only be truly achieved in struggle that confronts imperialism and Zionism led by the popular classes of Palestine and not by the small sector that currently dominates Palestinian political decision-making and has played a dangerous role in normalizing attempts to liquidate Palestinian rights and the Palestinian cause. 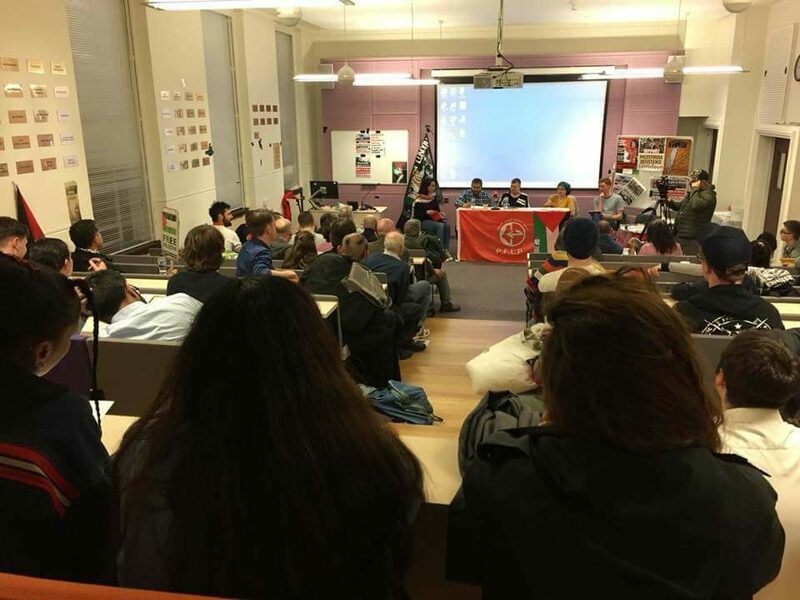 The event in London was chaired by Palestinian organizer Lara Khalidi and began with statements from Irish organizations, including the Republican Network for Unity, expressing the solidarity and support of Irish republican organizations and political prisoners for Palestinian prisoners. In response, Kates, Barakat and the other speakers noted the long-time joint struggle of Palestinian and Irish movements confronting British and Zionist colonialism, particularly the transnational bonds forged between hunger strikers and jailed strugglers for their people’s freedom. Ben Geraghty spoke about the RCG’s work in supporting the Palestinian struggle, especially noting the importance of confronting British imperialism and British policies at home and internationally. 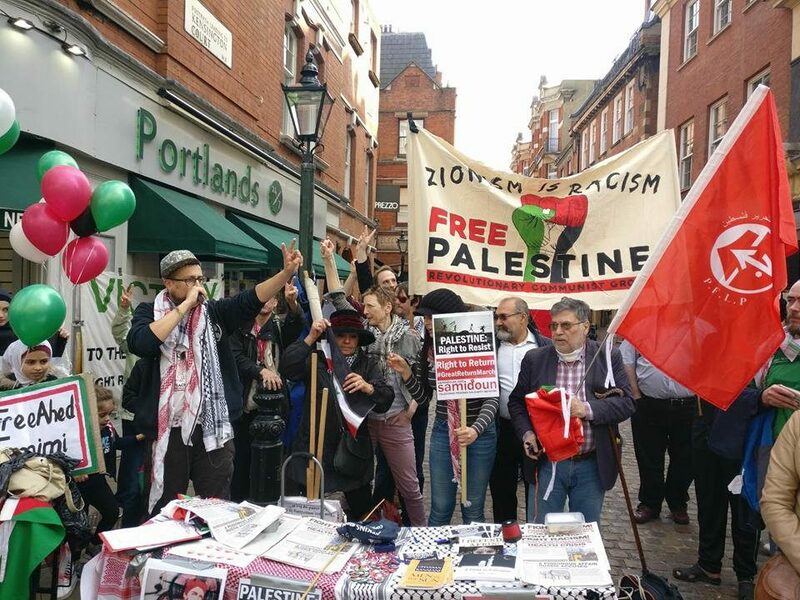 He spoke about the recent confrontation of RCG activists and others who kept Zionist forces from seeking to join a “Stand Up to Racism” march in Glasgow while carrying the flag of a racist state. He also noted the importance of confronting British participation in the attacks on Syria alongside the United States and France, reflecting its continued imperial role in the region. Maysa Shqeir presented an informative analysis of Zionist settler-colonialism in Palestine, focusing on the distinguishing characteristics of settler colonialism in displacing indigenous peoples and controlling the land. She noted the Zionist movement’s deep roots in European colonialism, analyzing the texts of Zionist founders as well as contemporaneous politicians in viewing the role of Zionism in Palestine as one to control and marginalize the indigenous people of the land. She provided an overview of specific characteristics of the Israeli state, including its intense militarization, violence and deep links with imperialism. 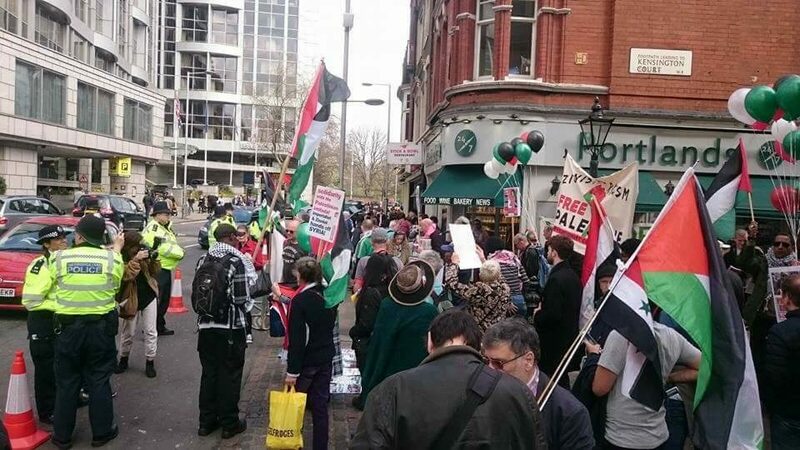 The events followed a demonstration on 14 April in London, in which protesters gathered outside the Israeli Embassy to demand freedom for all Palestinian political prisoners and support the right of return of Palestinian refugees while expressing outrage at the latest Israeli crime, the killing of dozens of Palestinian marchers toward the colonial “border” imposed on Gaza by occupation forces. 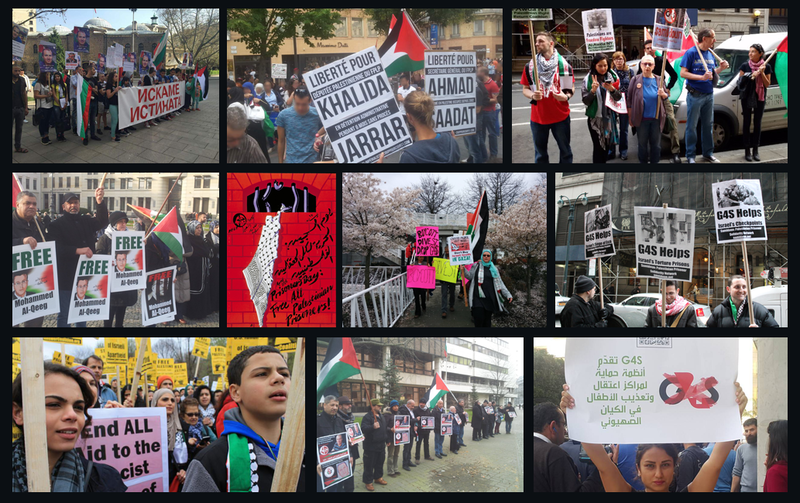 Participants carried signs demanding liberation for Palestine, support for resistance and freedom for all Palestinian prisoners.